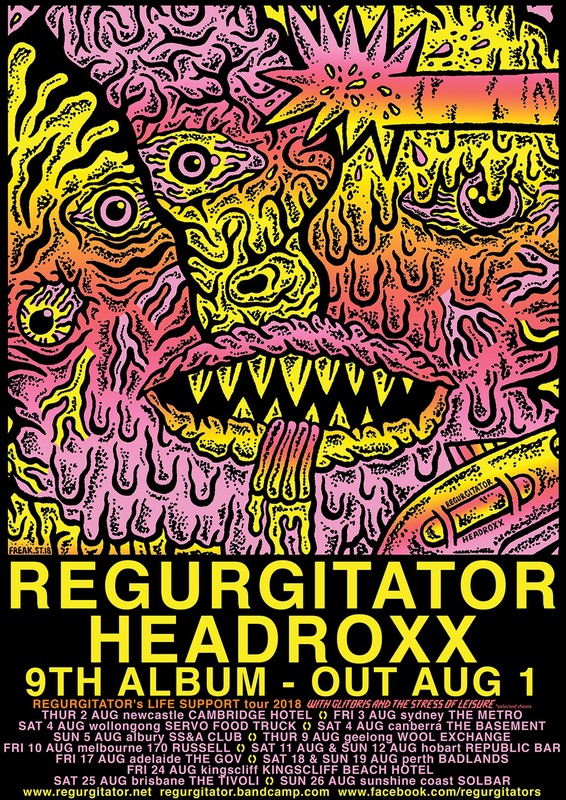 REGURGITATOR – HEADROXX your way AUGUST 1. HEADROXX your way AUGUST 1. “I’d been having trouble sleeping for a few days. Some kind of pressure in my head seemed to be building. It felt like it was filled with bread that was slowly expanding as it soaked up the surrounding fluids. No doctor I went to could give me any answers. They all prescribed pain killers in ever increasing potency. To little avail. After a week the pain was so unbearable the only relief I could find was by bashing my head on something hard like a washing machine or the dash of my car. After a week of this I went in for an MRI and the images, though at first unbelievable, seem to confirm that my skull was host to a rather nasty infestation of song larvae. I went home and tried to control the unrelenting agony and the fear that was creeping into me but before I knew it I was once again bashing my head up against a computer screen. I smashed it with such force that finally the invaders fell out, along with some small, relatively unimportant bits of my brain. The pain abated almost immediately. Driving you to the brink… in comes album #9 – the augmentally named HEADROXX. Sliced, spiced and reintegrated in their domestic chop shops – Quan & Ben continue to record and mix their special take of audio mayhem to birth albums that reflect their engagement with the worlds around them. Augmented with some supplemental recording together with Peter at Greg’s studio in Byron Bay, as well as a touch at Wild Mountain Sound. Mastered by Margaret Luthar at Chicago Mastering and all wrapped up in the illustrative exuberance of Benjamin Adams ala Freak Street (https://www.facebook.com/freakstreeet). With the afore motioned LIGHT ME ON FIRE and DON’T STRESS the full dish now arrives with such flavoursome ditties as PARTY LOOKS; GRAFITTI IS COMING ALIVE; I GET THE INTERNET; ROXX FOR BRAINS and more… including Peter Kostic’s wonderfully penned WEIRD KIND OF HARD. Ha… just a flock of free flying canaries in a data mind about to upload… feel that lateral motion. Sometimes they hold the door open with rocks… other times they just found their head stuck in that door. Whatever the case, once inside they never get out. With a LIFE SUPPORT tour already on the front foot… the details run wild. The Spirit of Ian Curtis. Bodyrocking often starts around six months of age. Headrolling and headbanging usually start at around nine months of age. Most people stop this behaviour by five years, but occasionally it keeps going after this. Keepin’ on, Roxxin’ on! FRI 3 AUG sydney THE METRO – SELLING FAST! SAT 4 AUG wollongong SERVO FOOD TRUCK (afternoon) – SOLD OUT! SAT 4 AUG canberra THE BASEMENT – SELLING FAST! FRI 10 AUG melbourne 170 RUSSELL – SELLING FAST! SAT 18 AUG perth BADLANDS – SOLD OUT! SUN 19 AUG perth BADLANDS – SELLING FAST! FRI 24 AUG kingscliff KINGSCLIFF BEACH HOTEL – SELLING FAST! Simulation so good its hard to believe. Digital through Bandcamp and all other outlets.